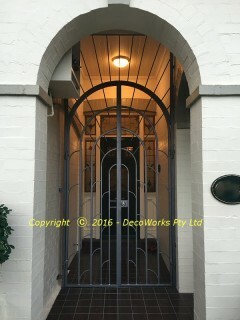 ODEON style Art Deco security doors on an Inner city semi. 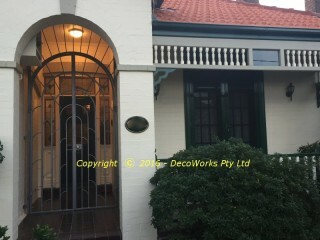 These ODEON style Art Deco security doors make an attractive additional to this turn of the century Sydney Semi. The double doors stand three metres tall and mirror the arched entry to the verandah. The high centre opening doors create an impressive and expansive entrance to the house. The top and bottom drop bolts used to secure the left hand side door have been fitted inside the door frame and operate in a similar manner to a rifle bolt with the operate knobs fitted near the centre of the door. With the right hand side door locked the drop bolts are also locked as they can only operate with the right hand door open. The all steel framework is painted a metallic grey and fitted with plain dead lock. The ODEON is one of several designs unique to DecoWorks Pty Ltd. 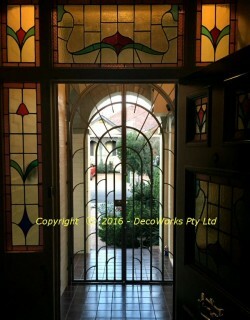 This entry was posted in Art Deco, Projects and tagged door, security, verandah. Bookmark the permalink.